Create powerful integrations for a global marketing and sales community. HubSpot is the central nervous system of tens of thousands of sales and marketing teams across the world. When you build on HubSpot, you plug directly into how they work. Want to integrate your tool inside the HubSpot CRM? The CRM Extensions API gives you access to the HubSpot UI, saving users time, and spiking your usage. You can now dynamically surface data in a card in the CRM sidebar for your users and create a window that gives users access to your software. The experience makes it feel like your software is built into the HubSpot CRM. The contact database sits at the center of HubSpot. It’s connected to every tool, actively absorbing new information about prospects and customers. 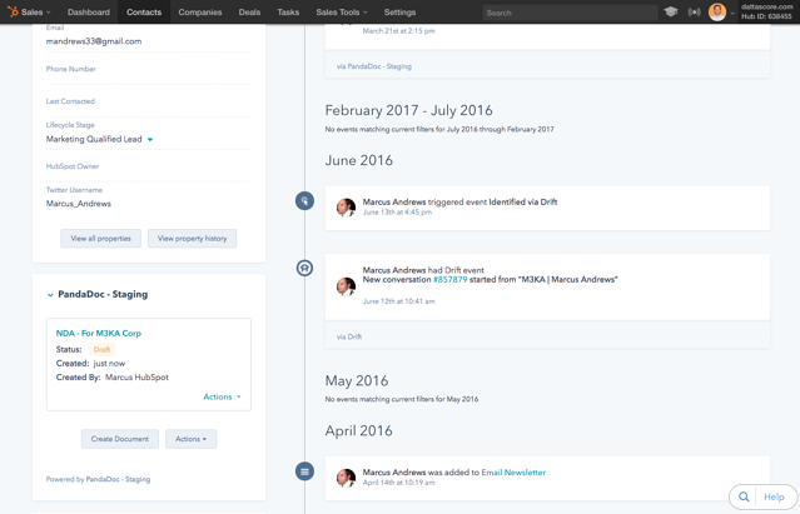 The Timeline API gives you write access to the contact timeline, allowing you to add your custom events to HubSpot records. This data then becomes a signal in HubSpot, to build lists, email sends and much more. HubSpot’s Webhooks API syncs data to your app from HubSpot in near real time. You can subscribe to Contact, Company, and Deal creation, property update, and deletion events in HubSpot, and we’ll push that data to your app anytime one of the events occurs. If your app is used by multiple customers, you can configure Webhooks once and they’ll work across all portals connected to your app, and we handle error retries and logging on your behalf. "One of the greatest challenges with sales related data is knowing when to expose the right data. HubSpot's Timeline API made it easy for PandaDoc to provide actionable insights to our joint users when it matters most. We didn't have to think about it, Timeline just made it much more simple and intuitive to integrate." Find everything that you need to get started in our complete and current API documentation library. Meet your peers in the HubSpot API development community. Share ideas, make connections, and get answers, fast. For help with COS design or HubL, check out the HubSpot Designer Forum here.